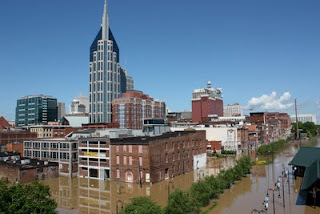 Last month, I started thinking about this weekend-- the one year anniversary of the Nashville flood. My neighbors, Ashley and Michelle, and I talked about how we wanted to commemorate the anniversary. And for me, I knew of no better way than to put together a mix of songs that resonated for me and to write about it. Today, I will spend the evening with my neighbors. We will cry. We will hug. We will remember how we vacillated between fear, sadness, humor, and ultimately, the strength we found together. It is hard to believe that a year has passed. 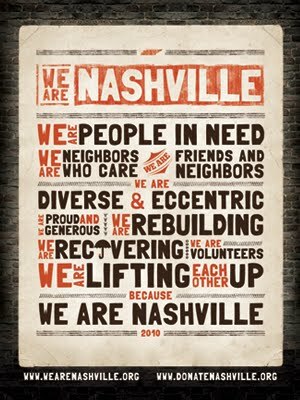 Perhaps harder still is to recognize that so many people here in Nashville are still trying to find their way. And harder still to think about the people recently impacted by the storms in the south. The ways in which disasters tear everything apart and simultaneously show you the power of community and friendship. And so here we are. One year later. I fear tonight I'll dream about that morning. I fear that in my sleep, I'll feel the water on my feet when I put them down on the floor that morning. But instead, I hope I'll remember how my friends came together to help, day after day. Whether they showed up everyday to move and clean my belongings, whether they brought over beer and offered their homes up to me, whether they bought me groceries to stock my kitchen for weeks, whether they donated their furniture to me, whether they simply sat with me while I cried and sat on my empty living room floor, or whether they called me late at night to give me support from faraway places. These are the things that I hope I will think about tomorrow. And...undoubtedly, when I throw my arms around Ashley and Michelle today...I hope I'll be able to cast off the sadness and realize how despite the destruction and all that we lost in the flood, I gained two of the greatest friends. Friends that I know will be forever in my life, no matter the distance or time. "Left in the morning, while you were fast asleep, into an ocean of violence, a world of empty streets...I'm gonna work it out, cause time won't work it out..."
"Stood here in the morning, got no science to explain, seems to me that God and the devil are both the same..."
"Stay here for a little while more, 'cause its a funny thing, I need a friend, not an angel..."
"Under sad stars in dingy bars, we turn away, we tear apart, one drop of grace, distant and safe, they cannot touch you where you are. Cold shafts of rain falling dark gray, falling so far they can't be saved, they cannot hurt you anymore, here underneath these sad sad stars..."
"I want to take you out at night, go on a date, go to someplace nice, somewhere we can watch the water flow. Niagara Falls, maybe down in Mexico, someplace, not this apartment...This is our home, this is our home, I understand now, we gotta get to it alone..."
"When the bottom fell out, There wasn't any doubt, I just suddenly found myself free falling, And from such a great height, The wind it had a might. And it took all my might to fight the fright. And falling spread eagle, must of formed an airfoil or some kind of wing, And I gained some equilibrium, And caught myself gliding..."
"Let the sideways rain in the crooked street remain...Everything must belong somewhere, I know that now, that's why I'm staying here..."
"And after the storm, I run and run as the rains come, And I look up, I look up, on my knees and out of luck, I look up. Night has always pushed up day, You must know life to see decay, But I won't rot, I won't rot, Not this mind and not this heart, I won't rot. And I took you by the hand and we stood tall, And remembered our own land, what we lived for. And there will come a time, you'll see, with no more tears. And love will not break your heart, but dismiss your fears. Get over your hill and see what you find there, with grace in your heart and flowers in your hair." "I'm full of bees, who died at sea...It's a wonderful life..."
It seems that as long as I can remember, spring has always ushered in new crushes. Apparently, I'm not alone in this...even Bambi and his friends get "twitterpated" with the arrival of spring. See below. Even after all these years, I find myself absolutely crushed by crushes. Just like Owl says in the clip, you are walking by, you see a pretty face and just like that, your knees go weak. Perhaps it is the promise of something new, like the beginning of spring. The moments in between, before you've even met the person. And you can engage in all types of ridiculous hopeful behavior. You can speculate about what it might be like when you actually work up the courage to talk to your crush. You find yourself wondering...What is his name? What if it is Richie? Could I date a Richie? What if he has horrible taste in music? What would it be like to date someone who is a _____(yes, I'm protecting myself here). What if he wears some old white Reebok tennis shoes in his free time? You can wonder about all of this with your closest friends, giggling all the moments in between. But I suppose the best part of it is all the unknown, all the questions, all the wondering. Just like we all do with our favorite baseball teams in April. It is the hopefulness and excitement of a new season. Yep, I'm blushing right now just thinking about it. Entonces, I'll celebrate new crushes and a new season. So, I put together this 8-track mix of crush songs...those that can accompany you when you spend a lazy afternoon in the yard (or side-yard for me and my neighbors) and think of days to come. And just maybe, I'll work up the courage soon. 5. 'Reak Scene- Dinosaur Jr.